← Is Competitive Bidding the Best Way to Hire a Kitchen or Bath Remodeling Contractor? Natural wood cabinets, muted color scheme. 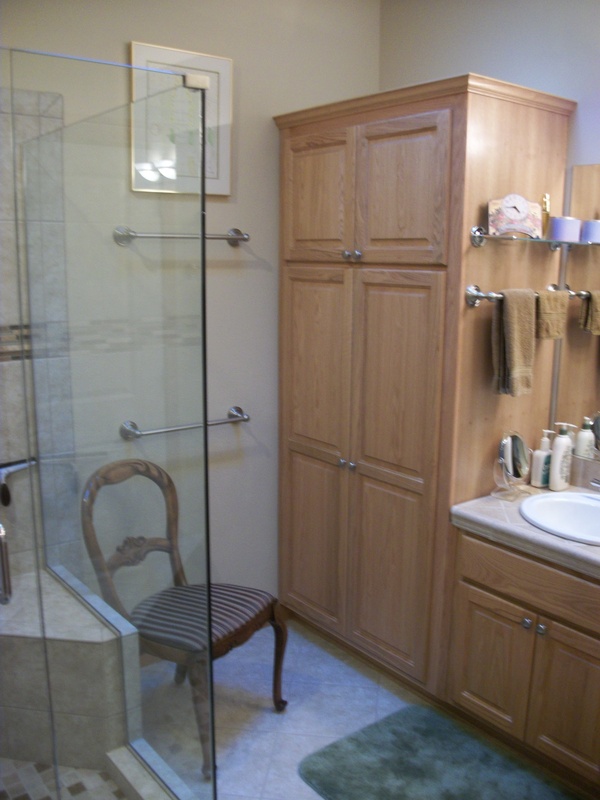 Is relaxation what you want in your master bath? A relaxing atmosphere can be achieved in variety of ways. Whether it is the shape of the bathtub that makes a difference, the inspiring decorative objects or a view that can be admire, there is a great array of bathroom designs that provide a relaxing experience, depending of course, on the personality of the owner! A relaxing interior can be rich in green arrangements, which add freshness and invigorate the place. However, some find bright, bold colors calming. While or experience at Rose Construction has been that the majority prefer more muted color schemes. Windows can be of major importance, as they have a huge influence on the aesthetics and atmosphere of a room, where there is an appropriate wall (or ceiling) to locate them; and a desirable view can add spectacular dimensions to the relaxation. Fireplaces in master baths are great for our natural reaction a warm, cozy fire – very calming. Wood has a great effect in modern bath decor – it adds authenticity and personality. Natural wood in just the right places can create a relaxing spa-like atmosphere. Color can be used to create a masculine atmosphere (think dark tones, even black accents), or to imply a feminine touch (you know the colors). Of course, some prefer a bathroom that looks more pure, invoking a clean feeling. This goal tends to need lighter colors, including nearly all-white bathrooms. Using monochrome colors has the same effect, and provides more for the eye to see – such as a black-and-white themed bath, or even tan and brown. If elegance is your thing, there are bathrooms designed to include ornate framed mirrors, elegant chandeliers and flowery patterned wallpaper, invoking the feeling of elegant eras in the past.